With the RAV4, Toyota was playing the crossover SUV game long before the Nissan Qashqai came along. Sadly, in aiming to be different this new RAV4 just isn't as appealing as many of the crossovers now vying for your attention. Click play above to watch Mark's video review. I heartily agree. IMHO the automotive industry reached "peak styling" a few years ago. Now its all lipstick on a pig. Excellent reviewing as always. Thank you. 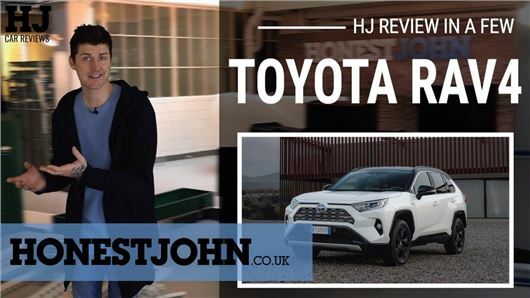 Not much about economy in this review - surely the main reason why potential buyers would consider the RAV4. Also, no comparison with its closest competitor - the CRV Hybrid. So I didn't find this review very useful at all. Wish reviewers would not turn their head to talk to camera when driving a car on public roads - attention repeatedly taken off the road ahead. There are drivers who are in the habit of turning their heads to face their passengers when talking to them when driving and it really is not good practice. Those are the half attentive seconds when a child or a dog runs into the road. Well Toyota used to do only smiley face cars, but now have gone to angry face. Never mind Fuel economy, or Cabin noise. It's first impressions that count and a car that looks at you like "Marvin the Android" doesn't give a good first impression. Whenever we get a professional review of a Toyotawe know they will not like it. Talk to any Toyota owner and you get a different story. No mention of what the towing capacity is..... a good reason for having a 4x4, but a weak spot of most hybrids. Great shame we don't get any conventional engines for this reason. Thanks Mark for another tip top review with a humorous twist, rather than being bombarded with the mundane press release "facts". But, why did the police pull you over and fine you 100 euros ? We were pulled over for a document infringement - apparently the documents that Toyota provided us weren't the right ones. Toyota assures us they were (and dealt with the whole thing very well), but it quite quickly became clear that the only way we were getting the plane home was to pay the fine and be on our way. Oh well.